A young artist from Milton of Campsie has won a prestigious diversity award. Mark Vice, a former pupil at Kilsyth academy, was awarded ‘Cultural Icon of the Year’ at the second annual awards ceremony, which took place at the Hilton Hotel. 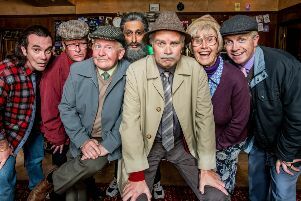 Presented by Jane McGarry, best known as Isa in hit BBC TV comedy series Still Game, the award recognises a creative individual who has promoted and supported diversity through the arts. As the only artist shortlisted alongside the likes of Hollyoaks star Annie Wallace and Scottish crime writer Val McDermid, Mark was honoured and ecstatic to have been named ‘Cultural Icon’ 2016. The 23-year-old visual artist said: “I am delighted to have won the cultural icon award at this year’s ceremony. For me it’s a very proud moment. The tech savvy artist who has sold his artwork worldwide puts his success down to the power of social media.